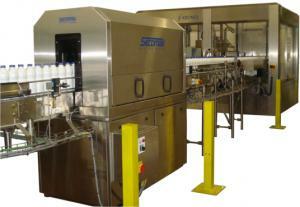 Modular air knife drying systems from Secomak are designed to fit over a clients own conveyor and guide system. They are used by food and beverage manufacturers to solve diverse drying problems, such as drying for date coding, label application, final packing, schrink sleeves, vision inspection, and drying ring pulls & seals. Metalic, glass and plastic containers (cans, tins, glass and plastic bottles and jars) can all be dryed with these systems. Powerstrip and Powerdry models are available. Modular air knife drying systems are complete drying solutions. With the selection of high velocity blowers, special acoustic enclosures reducing noise, and space saving features, they offer high performance, energly savings (compared to compressed air systems), ease of use and reliability.